Craving salad? This easy Chopped Wedge Salad is my go-to whether I’m at home or out to eat! Blue cheese & bacon together are always a good idea! A great salad is one of those things I crave. Heck, we even have pretzel salad for dessert sometimes. (It’s better than you’re thinking, promise!) But when it comes down to it, the wedge salad is my everything. 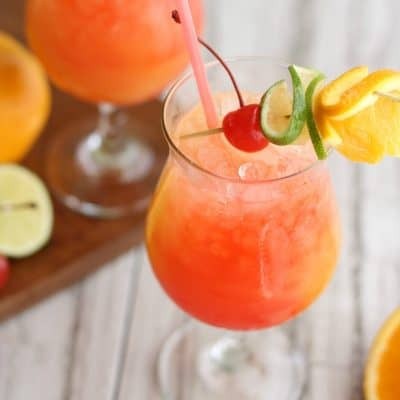 It’s simple, delicious, and has all my favorite flavors! But this salad also a little tricky to tackle if it’s on a side plate… and really who wants to top their salad and then have to cut it up. Well no more! 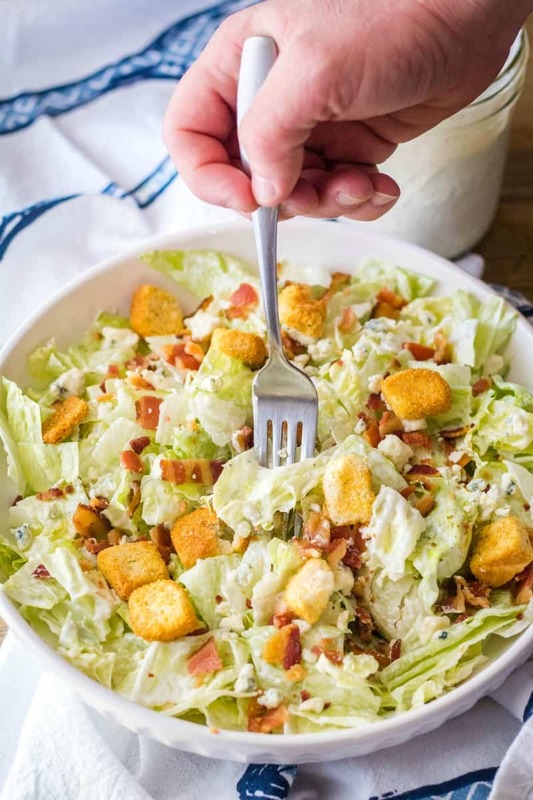 This crazy easy Chopped Wedge Salad is everything you love about a wedge salad but ready to eat as soon as it’s served! 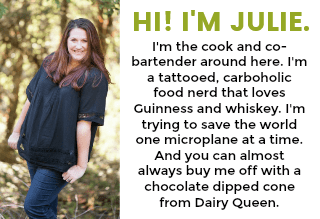 What is a Wedge Salad? 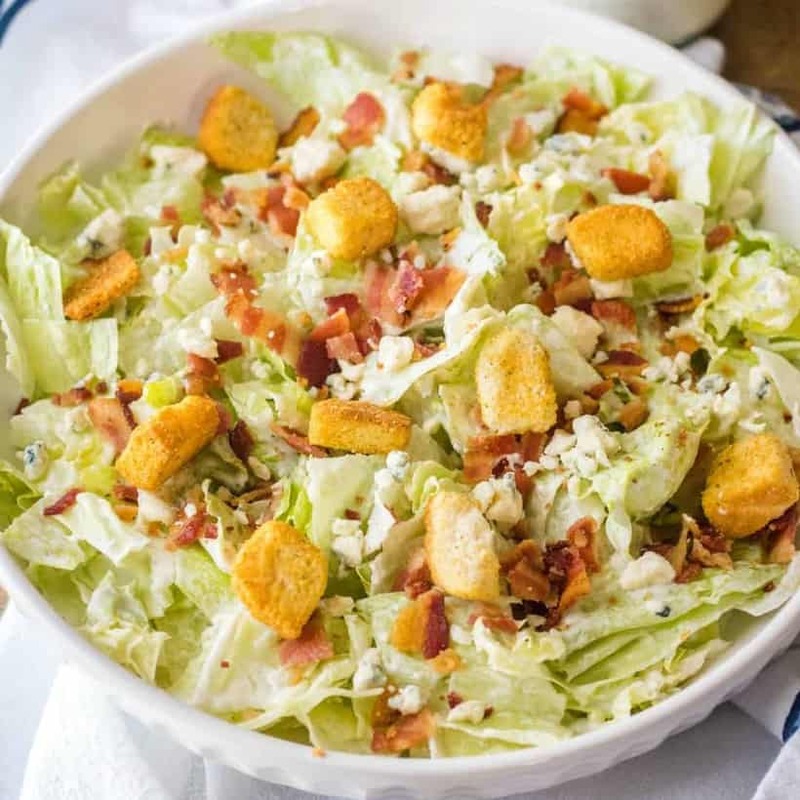 A wedge salad is a salad consisting of a wedge of iceberg lettuce (AKA 1/4 of the lettuce head) served with various toppings, typically blue cheese dressing, blue cheese crumbles, and bacon. Normally the wedge salad is served as just that, a wedge. While it’s pretty I have one big problem with that, the dressing coverage. I almost always end up ordering a side on dressing because while the top leaves get it, the bottom ones don’t. Yes, once I cut up the wedge things get easier and I can mix it all up, but why not just start that way. Boom! The chopped wedge salad. All the flavors you love in an easy to eat presentation. This is completely a preference thing. I have this blue cheese wedge salad both ways and love it no matter what form it takes. Cut the stem off an iceberg lettuce head. Rinse the lettuce and then cut into quarters. Place 1 wedge of lettuce on a serving plate. Drizzle with blue cheese dressing, blue cheese crumbles, and chopped bacon. Grab a fork and knife and dig in! 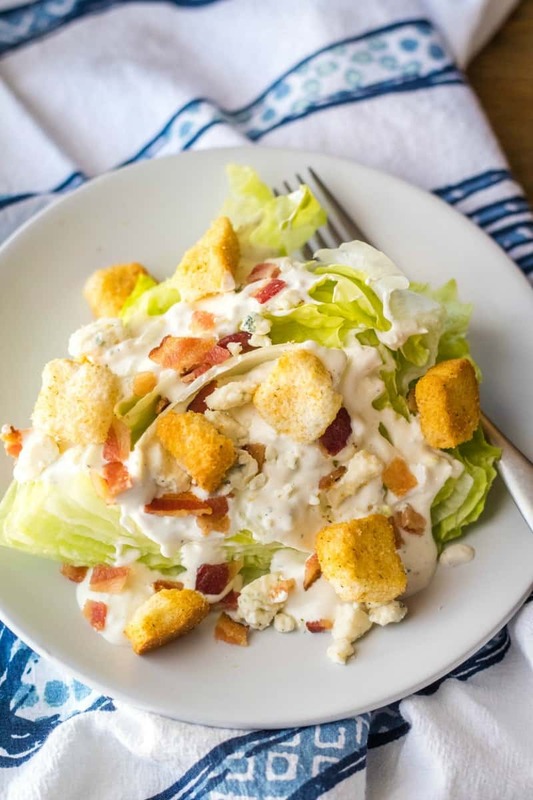 SUPER easy to make and this iceberg wedge salad will get you major presentation points. 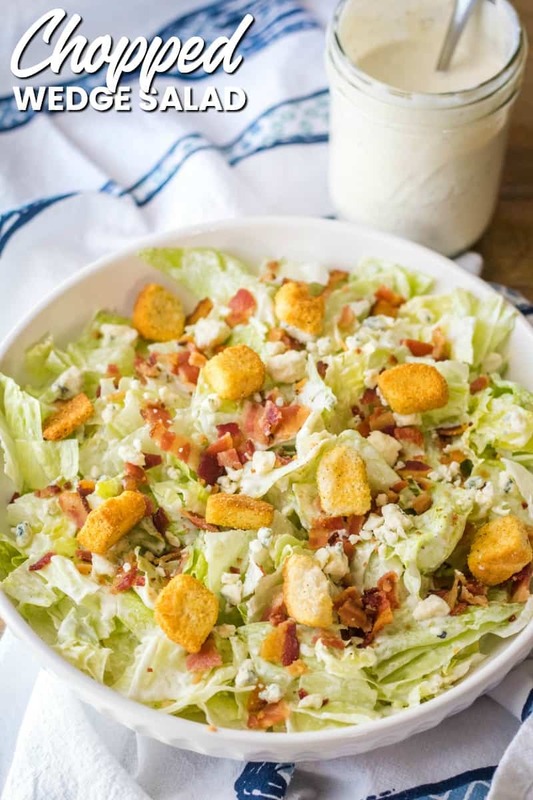 While blue cheese and bacon are the standard toppings for this salad, that doesn’t mean you can’t have a little fun! Here are some ideas that go great with this salad. 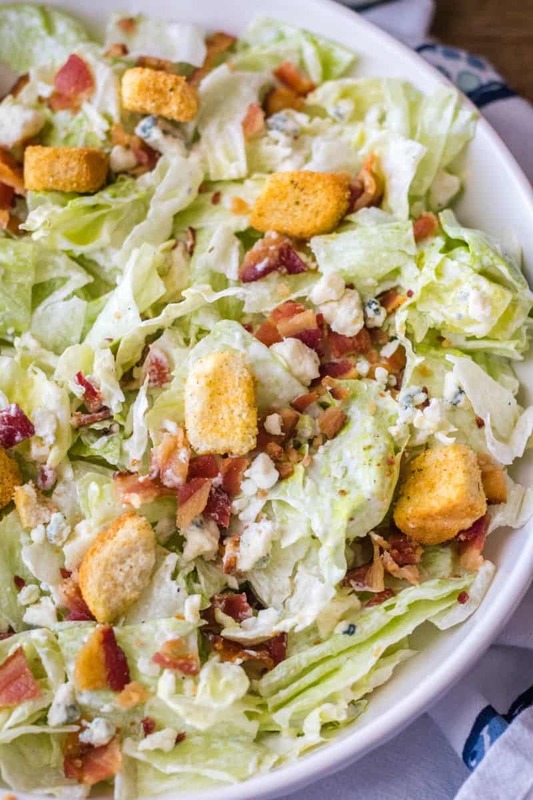 And if you’re a big fan of restaurant-style wedge salads, the Outback Wedge Salad is a traditional wedge topped with chopped bacon, halved grape tomatoes, diced red onions, blue cheese dressing, blue cheese crumbles, and a balsamic glaze. That does sound kind of amazing. 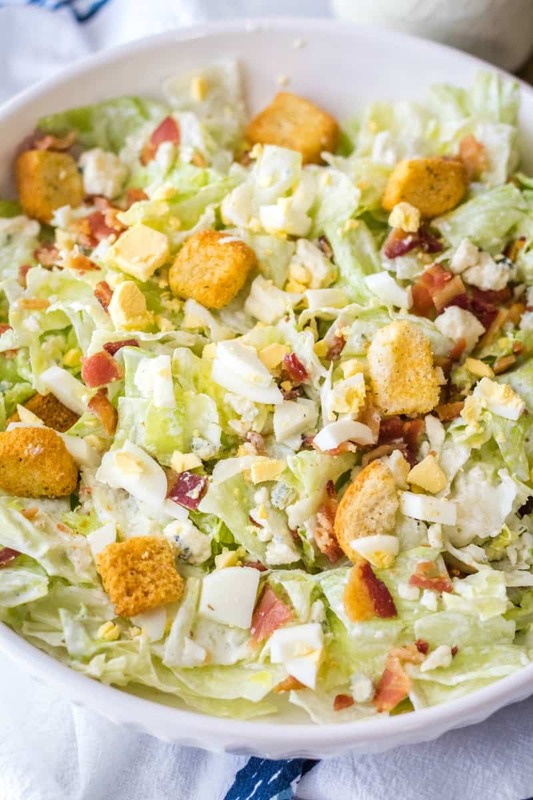 No matter how you choose to top your salad…grab a fork, dig in, and satisfy that craving friend! Craving salad? This easy Chopped Wedge Salad is my go-to whether I'm at home or out to eat! Blue cheese & bacon together are always a good idea! Heat oven to 400 degrees F. Line a baking sheet with foil. Place uncooked bacon on foil. Bake for 15-20 minutes until bacon is crispy, flipping once. Transfer to a paper towel-lined plate. Once cool enough to handle, chop bacon. Remove the outer layers of the lettuce head. Rinse lettuce and pat dry. Use a knife to remove the core of the lettuce. Chop the lettuce into bite-sized pieces. Divide lettuce among 4 salad bowls. Drizzle each bowl with 2 tablespoons blue cheese dressing. Top with 1 tablespoon blue cheese crumbles, and 1/4 of the bacon. If desired add additional toppings like croutons. Serve immediately. This recipe makes 4 side dish size servings or 2 meal size servings.